Summertime in Troy is beautiful. If you live or even just visit family or friends here there is one day that children and adults alike look forward to, the 4th of July. Even before Troy was incorporated as a city in 1915, celebrations of our nation’s independence took place here. Before there was a Chamber of Commerce to help organize it people still got together to make a special day take place for Troy. Jim Bowen, a lifetime resident, is one of those people along with a handful of others. Before having it at the City Park, the 4th of July celebration used to take place beside Morrison Elementary in the ball fields. Bowen recalls even further back to the year 1964 when he was nine. It was a pretty big deal that “Wallaby and Jack” were coming to Troy for the 4th of July, he said. They were the stars of a local after- school TV program in Spokane, Wash. Jack was a clown and had his pet Wallaby by his side for all the children to marvel at, even handing out bubble gum, Jim recalled. They also had a ‘grease poll’ that year. They perched a twenty dollar bill at the top and whoever could make it up to get it could claim the money. In the early 1990’s resident Tammy Anderson started volunteering for the 4th of July. She would continue every year until about 2008 serving as president for a few years on The Chamber of Commerce. “It was a fun, happy, and very busy time,” Tammy said in an interview with The Montanian. Still involved today, Tammy is Chairwoman of the local Tender Lovin’ Quilters. The group will hold their annual show on July 3 and 4 in conjunction with other festivities. There will be no shortage of entertainment for all ages and interests this year. The PTA/Booster Club will hold a 5K Community Color run/walk, and an all congregation church service which has been held annually since 2010 will be offered for the community to worship together. There will even be an old fashioned breakfast served at Roosevelt Park where you won’t empty your wallet to fill your plate. Attending the parade, the many activities, and of course staying to watch the spectacular fireworks display is sure to create some fantastic memories and continue Troy’s traditions. 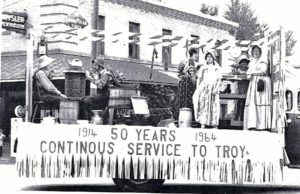 People start planning, sometimes months ahead, for their participation in Troy’s parade, but there is no need for registration, everyone is welcome. With local businesses, organizations, citizens, classic car owners, pet owners, the volunteer fire department, and even Smokey the Bear joining in along with many others, the parade will be sure to please eager families lining the streets to enjoy it. As with any long-running celebration, it takes hard work and new volunteers to take over jobs others have done for years. The beer garden at Roosevelt Park was run by Trojan Lanes from 2010-2017, and this year Joe and Robbee Pennock will take over. Also this year taking over the Chamber’s Cook Shack at the park is Crystal Denton, Bob Welch’s daughter. Bob and Joyce Welch ran it for four consecutive years back in 2012. Bob will still be helping out down there, and Crystal helped him in the years that he and Joyce did it. “Family helps family,” he told The Montanian. Bob Welch also founded Troy Cruzers Car Club, asking friend Joe Arts if he thought it was a good idea and to join him in the efforts back in 2002. This will be the club’s sixteenth 4th of July show. The Troy Volunteer Fire Department (TVFD) will oversee fireworks which will be held at dusk. The show has been sponsored by the community and Chamber of Commerce. Dusty Welch, TVFD Chief said the whole crew of 32 guys helps out. He has personally been involved with the fireworks show for 15 years. He and some of the others have completed a fireworks class which saves money on a third party coming in to put it on. For the past four or five years, the approximate cost was ten thousand dollars and with that, Troy has built an acclaimed reputation for their fireworks exhibit. Every year in about March, the countdown begins again according to Jody Peterson, President of the Chamber of Commerce. Peterson has been president of the Chamber for more than four years and she has also organized the vendors for the big day for approximately 15 years. This year there will be 14 food booths and 20 art/ craft booths including local young artists. “Supporting these artists/crafters will encourage them to return,” said Jody. However you choose to celebrate the 4th of July and America’s independence, please stay safe and have fun. That’s what Troy’s Old Fashioned 4th of July Celebration is all about. 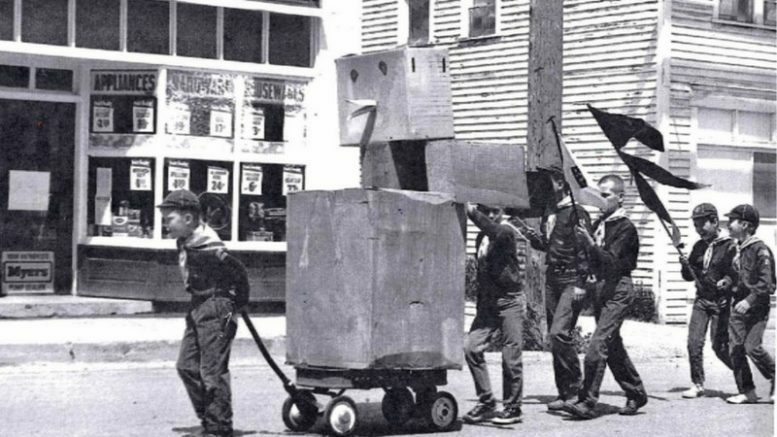 Top: Jim Bowen of Troy pulling the Boy Scouts parade float for the 4th of July parade in 1961. Photo by Clyde Bowen. Bottom: A photo taken of JM Clothing’s float in the 1964 4th of July celebration parade, that year marked the 100th anniversary of Montana becoming a territory.